I am always eager to learn more about Twitter. One never knows which tip or tidbit will help lift an account from obscurity to high-profile. 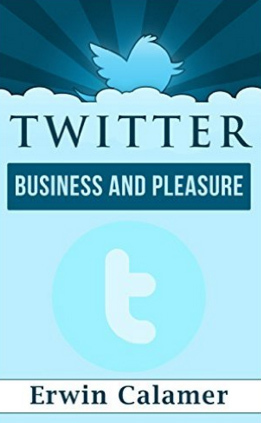 So with that in mind I picked up Erwin Calamer's book "Twitter Business and Pleasure." First off, this book is short. It's barely 33 pages. So don't expect a massive tome or lots of examples. You're getting the bare basics here. And since a lot of the content is fairly "filler material," what you end up with is even more basic. You learn a bit about Twitter's background. How it's a system that focuses on short, 140-character posts. How hashtags, or keywords indicated by the # sign in front like #HaitiEarthquake, help fans of topics easily find posts made that are relevant. You get step by step instructions on how to sign up. But the book barely covers any of the topics that a Twitter user needs to know in order to use the system well! It mentions hashtags but there really aren't any examples of good or bad hashtags. There isn't any discussion about how to optimize hashtag use to reach the largest audience. There isn't a discussion about how many or few hashtags to use. All of that is critical for Twitter. The author seems convinced that having more followers means you're more famous - when really it could simply mean that you belong to three or four networking groups and got them all dumped on you for no effort at all. Heck, it could mean you paid $29.99 to a follower supplier and had them added to your account. I know plenty of famous people who have few followers and also plenty of spammers who have massive numbers of followers. Follower count does NOT equate to fame and it's important to go into that for a variety of reasons. And, even with that being said, the book barely goes into how to GET followers. It doesn't talk about the 5,000 following limit and how to handle it. I have to wonder just what this author uses Twitter for. He states that the three ways to get people to follow you are to 1) post breaking news, to 2) be a celebrity already, or 3) to post photos of girls (probably scantily clad). What??? Can this be serious? The wealth of other ways to use Twitter for huge benefit are just mind-boggling. How can this be what he focuses on? And how is this even remotely useful for most real users? Similarly, he states that the people who use Twitter do so for three reasons - 1) to follow celebrities, 2) to read breaking news, and 3) to vent. Again, I say, what??? Just what kind of people is he interacting with on Twitter? And, heck, given his own previous example, shouldn't he have included the fourth option of Twitter users who primarily want to look at barely-legal naked girls? This all was bothering me enough, but the book is just RIDDLED with writing errors. Here are a tiny few of them that I happened to make note of. And, remember, the book is only 33 pages long. * Do I need to have friends already has a twitter account? but even back in August 2015 Twitter had over 1.3 billion users. When did he write this? His release date claims February 2016. That's a fairly important stat to get so wrong. but he completely fails to mention Google+ which has 1.6 billion users. Sure, he can dislike Google+ if he wishes, but to not even mention them when they have the largest user base? Isn't texting about using as FEW words and letters as possible, to compress it down into a quick-to-type text? What? How is this even a sentence, and how is this going to be intelligible to a new Twitter user? This book is seriously in need of an editor and an overhaul. With the wealth of other stunning books out there on Twitter, I just can't recommend this one. It could actually cause more harm than good. Even someone who wanted to post model photos of barely-legal girls wouldn't learn how to build up their follower count or to use hashtags, based on what this book provides.